The massive orange and white live squid was filmed swimming next to a boat's moorings in Toyama Bay on the west coast of Japan, according to Motherboard. 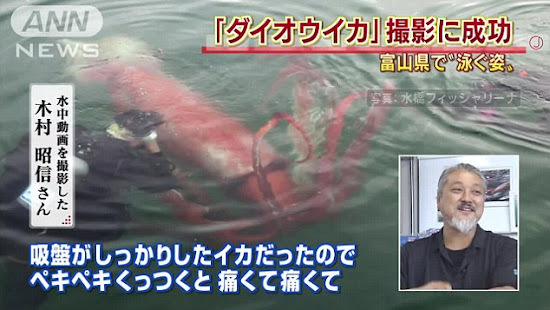 Such large squid live deep underwater and are normally only found dead floating on the surface of the ocean or washed up on beaches, according to Ocean Portal. 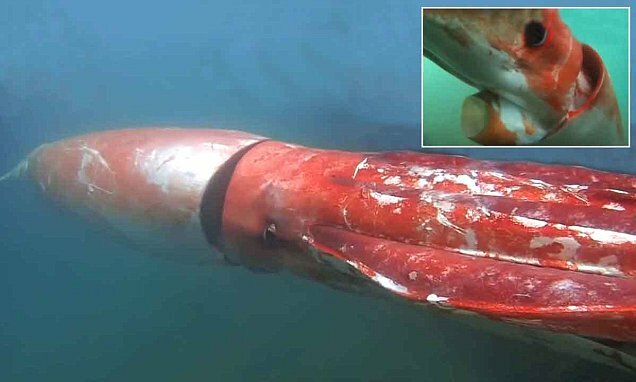 In a second video, the massive squid is seen swimming in the populated harbour with a growing crowd viewers looking on as it inches closer toward the surface. A man is seen jumping into the water decked in diving attire to get a closer look at the squid, which was about one metre wide. After the images and videos were posted on social media, viewers insisted that it was an incredibly rare Architeuthis. The Architeuthis squid is the largest ever to be recorded by scientists at 13 metres long and weighing about one ton. It is estimated that the squid live up to five years so they grow to be very large quickly. During that time they will reproduce only once.